Until I’d finished college, the most exotic thing I put into in a chicken sandwich was tomato. Later I dared to flirt with Dijon mustard over the electric-yellow domestic variety. But it was years before my taste buds graduated to that most foreign of sauces, pesto. Discovering pesto was like finding a third arm. Before long I was including pesto in everything from breakfast to dessert, with varying degrees of success. 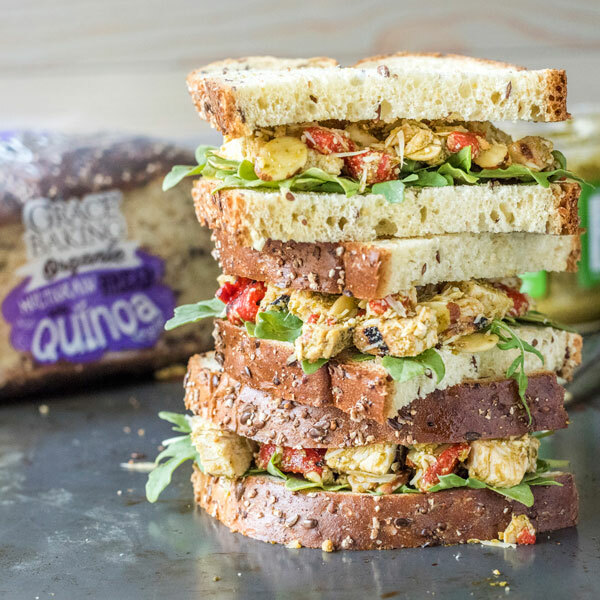 Pesto is the perfect counterpart to chicken heaped between two aptly thick slices of Grace Baking Organic Multigrain With Quinoa. This is bread that’ll convince anyone that it was created expressly for chicken, cheese, almonds, roasted red pepper and garden fresh arugula. There’s just something about the nutty, garlicky, cheesy flavor of pesto that makes chicken come alive. So to speak. Perfect anytime, anywhere. In a large mixing bowl, combine chicken and pesto until chicken is evenly coated. Fold in parmesan, almonds and roasted red pepper. Lay arugula on one slice of bread. Top with chicken salad, and the remaining bread slice. Enjoy!